Charlottesville, VA – On Thursday, October 12, the Institute for Constitutional Advocacy and Protection (ICAP) at Georgetown Law School filed a criminal complaint in Virginia state court against a list of organizations and individuals. The legal filing seeks to enjoin a variety of groups involved in the Unite The Right event from continuing to conduct “illegal paramilitary activity” in the state of Virginia. Militia are described in the complaint as purporting to serve as ‘peacekeepers’, while in actuality using the threat of deadly force to intimidate all who would oppose Unite The Right, which the complaint notes included not just confrontational antifascists but also unambiguously peaceful protesters such as clergy. The ‘factual allegations’ laid out in the complaint, include a detailed re-telling of the events of August 11th and 12th, and describes how the night before Unite The Right, various militia groups “engaged in joint training exercises” on a farm property in Unionville, VA. Defendants Jason Kessler and Eli Mosley are also described as reaching out to recruit militia groups to provide armed security services for Unite The Right – services which, according to the complaint, required a license from the Virginia Department of Criminal Justice Services. Details asserted in the complaint include evidence of a militaristic command hierarchy that permeated the organizing for Unite The Right, with several militia leaders boasting of having people “serving under” them. 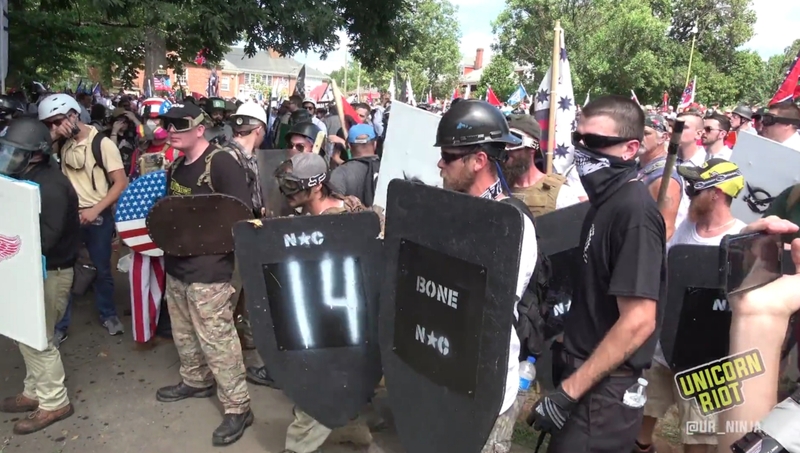 The complaint refers to those named in two different ways – the “Alt-Right Defendants” and the “Militia Defendants.” Various individuals and groups are described based on the roles they played on the weekend of August 12. The “Alt-Right Defendants” include Jason Kessler, who was the primary local Charlottesville organizer for Unite The Right, and the main facilitator for the Charlottesville 2.0 Discord server. He can be seen below at the beginning of the torchlit march on UVA campus on Friday, August 11. Another key Unite The Right organizer named in the complaint is Eli Mosley (real name Elliot Kline). Mosley was recently appointed as the new leader of the violent white supremacist group Identity Europa. He was one of the main coordinators of the Unite The Right, playing a key role in planning over Discord and in overseeing the military-style units of white supremacists engaging in street violence in and around Emancipation Park on August 12. The Traditionalist Worker Party (TWP) is named in the complaint, as are Matthew Heimbach and Cesar Hess, two of its leaders. 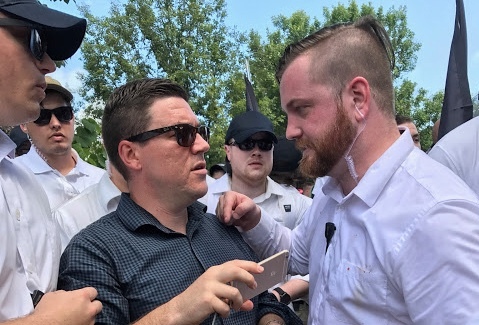 Heimbach and the TWP were one of the main forces behind the April 29 neo-nazi event held in Pikeville, KY to announce the formation of the new “Nationalist Front.” Video from August 12 in Charlottesville shows a Nationalist Front contingent, including a TWP contingent led by Heimbach, violently attacking a group of counter-protesters. The Nationalist Front contingent, seen in the video above, included delegations of members of League of the South and the National Socialist Movement. The League of the South is named in the complaint, along with two of its Chairmen, Spencer Borum and Michael Tubbs. The National Socialist Movement is also a defendant along with its “commander” Jeff Schoep (who can also be seen in the video.) The neo-Nazi organization Vanguard America also announced their participation in the Nationalist Front at the April 29 event in Pikeville; ‘Vanguard America’ (whose members as of recently are trying to rebrand themselves as ‘Patriot Front’) is also named as a defendant. The April 29, 2017 neo-nazi rally in Pikeville, Kentucky was attended by the groups making up the ‘Nationalist Front’ – the Traditionalist Worker Party, the National Socialist Movement, the League of the South, and Vanguard America. The “Militia Defendants” group includes the Pennsylvania and New York chapters of the Light Foot Militia, as well as Christian Yingling and George Curbelo. Francois Marion is named as a defendant along with his organization American Freedom Keepers, LLC, whose members were recently spotted at the “Mother of All Rallies” pro-Trump event in Washington, DC on September 16. Also on the list of defendants is Ace Baker and his militia organization American Warrior Revolution (AWR). The lawsuit also two names leftist, anti-racist armed groups – Redneck Revolt and the Socialist Rifle Club – and includes them mixed in on the defendants list with a list of right-wing white supremacist militias without clearly differentiating between them. This has led some to view the lawsuit as enabling a cynical attempt to increase the powers of local and state authorities that by all accounts stood by and did basically nothing on August 12. Emily Gorcenski, a Charlottesville resident involved in opposing Unite The Right, sent a series of tweets criticizing the lawsuit as harmful to future anti-racist self-defense efforts. Richard Preston, a KKK Grand Wizard, fired a single shot towards counter-protesters as he was leaving Emancipation Park on August 12, but no other gunfire was heard or reported that day. Just a short time later, James Alex Fields, Jr. drove his grey Dodge Challenger into a crowd of counter-protesters, killing Heather Heyer and seriously injuring many others that he ran over with his car. Charlottesville residents have claimed that the area where Fields drove into protesters was supposed to have been inaccessible to vehicle traffic that day, as it is often closed when events are held downtown. Charlottesville authorities have recently come under fire after an arrest warrant was issued for D’Andre Harris, a Black school teacher who was brutally beaten by white supremacists in a parking garage on August 12. The warrant was obtained by League of the South leader Harold Ray Crews presenting altered evidence directly to a local magistrate, effectively bypassing the police who claim they had no part in issuing the warrant. The warrant taken out against Harris is widely considered to be a retaliation after an online campaign led to arrests and criminal charges against several of the white supremacists who beat Harris. Richard Preston is currently in custody at the Albemarle-Charlottesville Regional Jail. He appeared in court on October 12 and claimed that he fired the shot in self-defense and he was denied bond by a judge. On Friday, October 13, Jason Kessler, along with Evan McLaren and Nathan Damigo of Identity Europa, appeared in court in relation to charges filed on August 12. All three were found guilty of failure to disperse and ordered to pay fines; they all reportedly plan to file appeals. Kessler was recently indicted on perjury charges in an unrelated case.